A.J. McKee is no stranger to being surrounded by MMA fighters. His father, Antonio McKee, went 29-6 as a professional and is a pioneer of the sport. He also helped create Team Bodyshop, an MMA gym that brings in athletes from around the world to train at the highest level. Now the athletes who sweat and struggle inside that gym every day are A.J. and his friends, like fellow Bellator standouts Joey Davis (4-0), Aaron Pico (3-1) and Kevin “Baby Slice” Ferguson (3-1). And for a trainer who has decried the lack of black leaders and mentors in mixed martial arts, Antonio McKee has stepped up to the task. Pico is only beginning his journey up the MMA ladder. A.J. (11-0) is already close to the top. 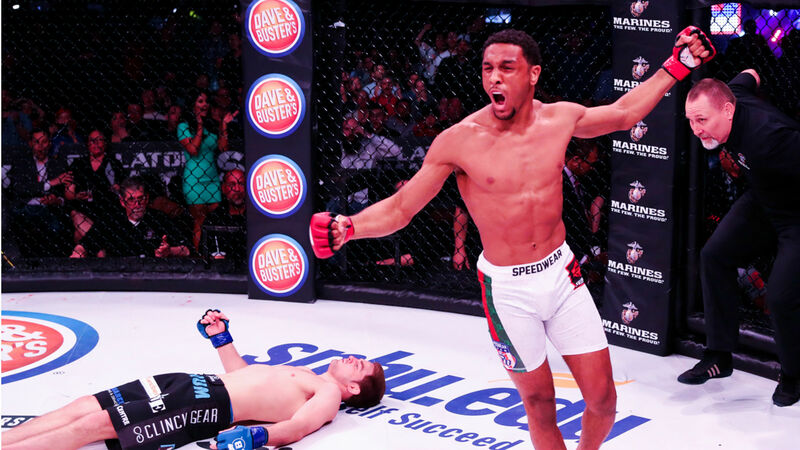 Although a win over his original opponent, former champion Pat Curran, would have solidified A.J.’s shot at Patricio Pitbull’s bantamweight title, a win this Friday at Bellator 205 over John “Macapa” Teixeira could bring the same result. Despite the fact that A.J. is 23-years old and Pico just 21, they are no strangers to the grueling training found inside Team Bodyshop. That extensive training has paid dividends for all four fighters, who have taken a unique road to this point. Their 23 combined professional fights have all come inside the Bellator cage, for one of the top MMA organizations in the world. If all their dreams come true, there stands one significant problem. Both A.J. and Pico fight at 145 pounds, and the Bellator bantamweight title only fits around one waist. But according to Pico, that fight is not in the cards. But how long until the fans demand it?